02.03.2009 Introducing Grace Anderson Chapple The Newest Blossom In Our Bouquet! This is my husband Evan and our new sweet baby girl Grace Anderson Chapple born Jan. 30th at 7:04pm. 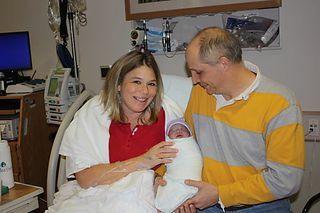 She weighed 7 pounds and 2.5 oz. and was 18 and half inches long. In addition to having a baby this weekend we also designed flowers for my good friend Lisa Schulz the Posh Party Planner at www.theposhplanner.com. She had a booth at the Dulles Expo bridal show. The fabulous Regeti’s photographed Lisa’s table and my flowers, you can see them on their blog. Go to www.regetis.com. I wouldn’t want anyone thinking I was slacking off this weekend. All of my babies from 21 years old down to 1 day old. 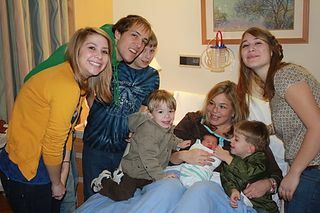 Alex, Abby, Hannah, Riley, Elijah, Samuel and baby Grace. 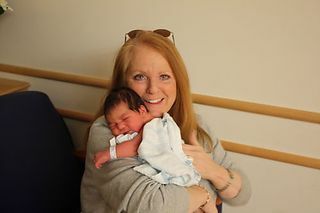 Wedding Planner and very special friend Cara Berger came to take a peak at Miss Grace. Having Cara as a part of my life is a huge gift and several years ago she was one of my brides. Do you need a wedding coordinator if so call Cara but be prepared to make a lifelong friend. www.celebrationsbycara.com. The beautiful Rocio Diaz from www.apieceofcake-va.com showed up with cake. It was a perfectly created pretty, pink confection. This is one unbelievable lady with four lovely children of her own, honestly her smile might be sweeter than the cake. Betty Franzen from Waterford Past-Thymes handles bouquet preservation for my brides. www.flowerspressed.com. We are giving Betty a big loud round of applause for helping this family keep the faith and to believe in the miracle of Grace. She is a awesome mentor and has a direct line to the big guy in the sky. We love the whole Franzen family and they are just another gift of this business. One of my brides mothers pointed me in Betty’s direction and she has been a friend ever since. 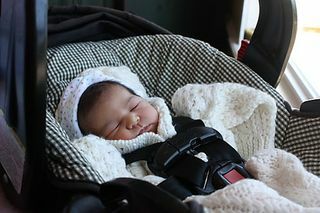 Gracie coming home for the first time. She sure is pretty, I have to admit we do really great work around here. 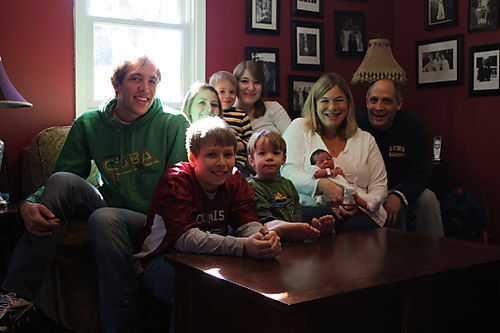 Our first family photo!!. We were so lucky to be able to get this shot. Our oldest son Alex came home from VA. Tech. just so we could all be together this weekend. Its always such a pleasure when we can be together. A big thanks to Alex for making the trip home this weekend. When he comes back next time Grace will already be 5 weeks old. To make the home coming perfect we had a cake and ice cream party. We got to splurge just before big brother Alex went back to college. 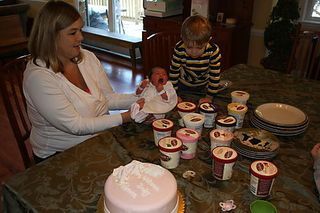 Publisher of Engaged Magazine, Doreen Tisone at www.engagedmagazine.com sent 12 pints of Graeters ice cream to keep the family busy. She thought I might find a minute for the baby if I could distract the clan with ice cream. Smart thinking on her part. What a great present.